Latin America is home to 635 million people, accounting for nearly 9 percent of the global population. This vast region also possesses 40 percent of the planet’s biodiversity, which – combined with sustained growth in agricultural production – makes it the world’s main food pantry. In recent decades, Latin America has had high economic growth. It is the first region in the world to fulfill the United Nations’ Millennium Development Goals of poverty reduction, prioritizing food security as it continues to improve the life expectancy of its inhabitants. The average lifetime of a Latin American is 75 years – five years longer than 20 years ago, which is a testimony to improving health conditions. This prosperity is largely associated with high productivity and competitiveness of our industries, which in most Latin American countries, is led by agriculture. 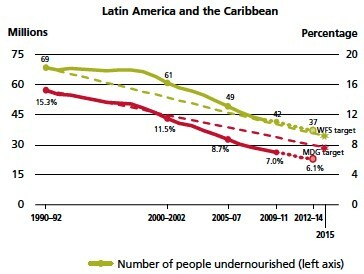 Source: “The State of Food Insecurity in the World,” 2014, United Nations’ Food and Agriculture Organization. This progress, however, is being threatened by activists who use strategies based on misinformation and fear, mainly with the use of political arguments disguised as “science.” They have special interests opposed to innovation and technology like genetically modified crops. Such positioning has led to an exaggerated crisis about honey bees being on the brink of extinction and European pesticide policies that could hinder agricultural exports from our region to that important market. The recent proposal of regulatory criteria for endocrine-disrupting chemicals by the European Commission has been received in Latin America with a high degree of concern. The proposed criteria would impose unjustified trade barriers and place political, not technical, restrictions on Latin American products currently exported to Europe. These restrictions would be in the form of maximum residue limits for pesticides that are impossible to meet due to unnecessarily banned substances. A recent study showed that agricultural trade could be cut by about €25 billion annually in exports from Latin America to Europe if the proposed criteria for endocrine-disrupting chemicals are approved. This would be a devastating commercial consequence. It is important that producers and exporters in the agri-food sector of Latin America are properly informed about international discussions regarding endocrine disruptors with actual scientific arguments. In the same way that Latin American governments are raising concerns in international diplomacy, such as with the World Trade Organization, the private sector must face the threat of policies based on hazard, not risk, that will unreasonably interfere with our competitiveness and productivity as the main pantry of the world. 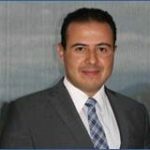 Mauricio Rodriguez, Ph.D., is director of scientific affairs at CropLife Latin America based in Bogota, Colombia. Para esta editorial en espanol, haga clic aqui: eds-in-latam-maurizio-rodriguez-spanish.